Home: Religion: Sikhism: The Ten Gurus. The term guru is Sanskrit, meaning teacher. The traditions and philosophy of Sikhism were established by ten specific gurus from 1499 to 1708. Each guru added to and reinforced the message taught by the previous, resulting in the creation of the Sikh religion. Nanak was the first guru and appointed a disciple as successor. Gobind Singh was the final guru in human form. Before his death, Gobind Singh decreed that the Gurū Granth Sāhib would be the final and perpetual guru of the Sikhs. The Sikhs believe that the spirit of Nanak was passed from one guru to the next, just as the light of one lamp, which lights another and does not diminish, and is also mentioned in the holy book. After Nanak's passing, the most important phase in the development of Sikhism came with the third successor, Amar Das. 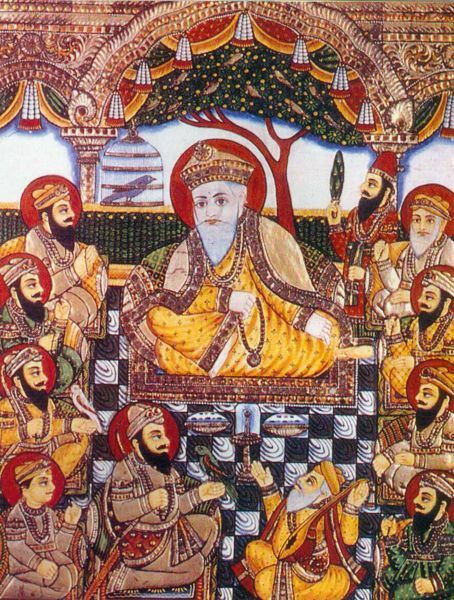 Nanak's teachings emphasised the pursuit of salvation; Amar Das began building a cohesive community of followers with initiatives such as sanctioning distinctive ceremonies for birth, marriage, and death. Amar Das also established the manji system of clerical supervision. Amar Das's successor and son-in-law Ram Das founded the city of Amritsar, which is home of the Harimandir Sahib and regarded widely as the holiest city for all Sikhs. When Ram Das's youngest son Arjan succeeded him, the line of male gurus from the Sodhi Khatri family was established: all succeeding gurus were direct descendants of this line. Guru Arjan Sahib was captured by Mughal authorities who were suspicious and hostile to the religious order he was developing. His persecution and death inspired his successors to promote a military and political organization of Sikh communities to defend themselves against the attacks of Mughal forces. The Sikh gurus established a mechanism which allowed the Sikh religion to react as a community to changing circumstances. The sixth guru, Har Gobind, was responsible for the creation of the concept of Akal Takht (throne of the timeless one), which serves as the supreme decision-making centre of Sikhdom and sits opposite the Darbar Sahib. The Sarbat Ḵẖālsā (a representative portion of the Khalsa Panth) historically gathers at the Akal Takht on special festivals such as Vaisakhi or Diwali and when there is a need to discuss matters that affect the entire Sikh nation. A gurmatā is an order passed by the Sarbat Ḵẖālsā in the presence of the Gurū Granth Sāhib. A gurmatā may only be passed on a subject that affects the fundamental principles of Sikh religion; it is binding upon all Sikhs. The term hukamnāmā (literally, edict or royal order) is often used interchangeably with the term gurmatā. However, a hukamnāmā formally refers to a hymn from the Gurū Granth Sāhib which is given as an order to Sikhs.